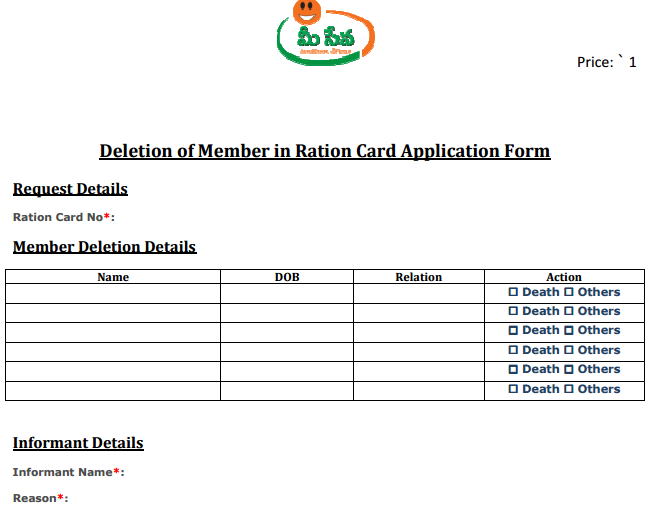 Delete name in ration card or remove name in ration card. Deleting name in ration card requires a separate application form and procedure which we have been shared right over here. In case if you have any doubts how to delete/remove name in ration then do leave a comment here. You can also Correct the details on Ration card. This ration card serves as an identity proof document or address proof document to the Indian Citizen and it also enables passage for the economically backward people to heavily subsidized food or grain from the ration dealer shop. The addition or removal of a family member from the ration card is an easy procedure. In this article, we are going to show you how to delete or remove a family member from the ration card. By the end of this article, you will be known how to remove a name from the list of family members in the ration card via Offline or Via Online. There will be two reasons to delete a family member from the ration card. The two reasons are listed as follows. When a family member dies or expires. When a family member leaves the household in case of marriage or leaves home for Work to live elsewhere. Whatever the reason, the name should be removed or deleted from the household list according to rules issued by the Central Government. Even though an individual leaves family to join another family, the individual has to remove his/her name from the list of household in the existing ration card to procure a new ration card. As some of the sites are still under working, the online procedure to apply for Name deletion and addition of name in Ration card can be a risky process. By the coming year, the sites can be restored and modified according to the news systems involving in the technological world. Visit your respective state’s Food and Civil supplies department website. Select “Ration card services” section on the homepage of the respective website. In the drop-down list of services select “Name Deletion Application”. You can either download the Ration card deletion form to apply offline or you can fill in the details online itself. The details are to be filled perfectly with proper information. The details generally included with the following list. Name to delete on the ration card. Relation of the member with the head of the family. Check out the delivery type. Document Proof that you need to be added. The above-listed details are to be filled correctly with genuine information. Avoiding false details in the deletion form can save you more time. After all the details are filled, you have to attach the documents that will support the details you filled in the deletion form. The documents uploaded with the deletion form should be scanned copies of original documents. After the submission of the form, officials will verify the documents attached to it. If the officials find any false documents uploaded as proof documents along with the deletion form, they will reject the deletion. How to Correct your Details in the Ration card online. The method of deletion of a member from the ration card is very much similar to the online procedure. The difference is that the forms are to be collected in the nearest food department office or even in the local ration card office. The deletion form is collected and the details are to be filled. The details in the deletion form will be same as the details that are included in the online deletion form. The documents such as Death certificate or marriage certificate which can be issued at the government offices. After the deletion form is submitted to the same office with all the attested certificates attached to it as the proof documents. The government officials will verify the documents and then delete the name on your ration card. The minimum required documents which are submitted along with the application are mentioned in the image above. The file sizes mentioned in the image are meant for the applicants who are applying for deletion of a member through online procedure. In some states, the application form given for Addition of a Family Member and deletion of a family member is same as the applicant has to choose what he wants from both options. The image below is the sample of the form of the Addition/Deletion form. The applicant has to select “Deletion” in the “Purpose of Application” as mentioned in the above-displayed image. Not only addition/ deletion but also modification can also be done in the same form. These forms can be collected from the nearest MeeSeva in respective local villages/town/cities etc. The procedure is almost same for all the Ration Card of Telangana, Tamil Nadu Ration Card etc. Later, the new and updated ration card can be collected at the nearest ration card office or it can be delivered to your residence address as mentioned in the proof documents.